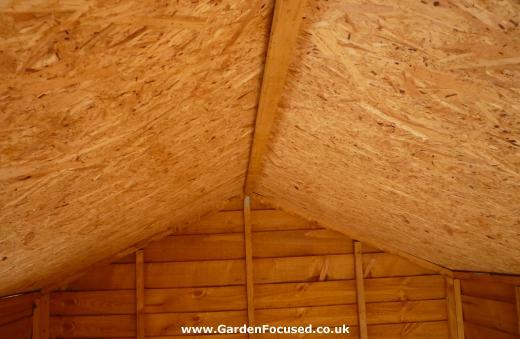 Economy garden sheds are something of a mystery to many gardeners although most of us have one in our garden. Which companies make them, which companies sell them, are they basically all the same quality within a given price range? We travelled just under 1,000 miles around the UK to see and test a large number of sheds. This article deals with wooden sheds, but click here if you want to read our in depth review of metal sheds in the UK. This article will clarify all of the above and more, enabling you to buy the best economy shed for your budget and needs. All our advice is totally impartial, we are not affiliated to any shed manufacturer. We have visited display areas for each and every one of the manufacturers / retailers discussed below to view and try out each of the sheds with the exception of Garden Buildings Direct (BillyOh sheds) who have no show area or means of actually seeing their sheds until they are delivered. The second average price check is as above but with tongue and groove construction. All prices were taken from the retailers online websites during May 2017. 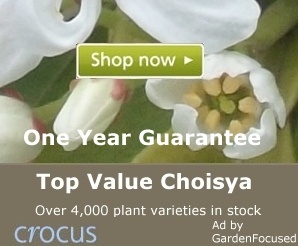 Please check for yourself when you have narrowed down your choice, prices can and do change frequently. The comments below for each manufacturer refer to the above two shed types to enable some realistic basis for comparison of the manufacturers / retailers sheds. 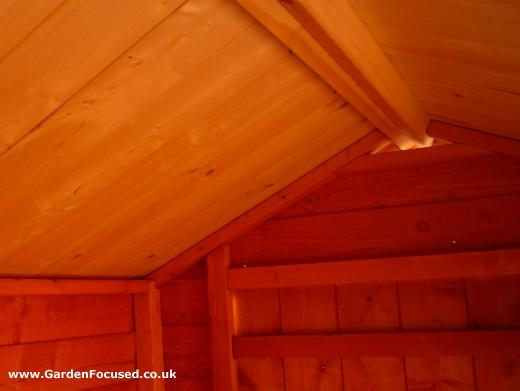 We list below the major manufacturers / retailers of economy garden sheds in the UK. 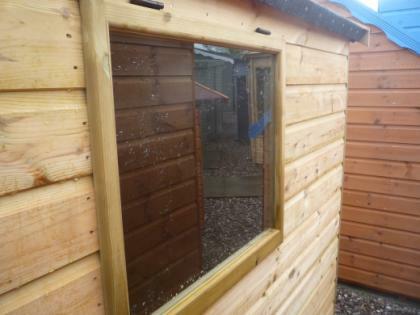 The products span from economy products at knock down prices to medium priced sheds. We have not attempted to include the more up market sheds. The shed business really is one where, in most cases, you get what you pay for. Rule one when buying a shed is to be able to see the product you are buying before you buy it. Glossy online sale pictures can transform a shoddy article into one which superficially looks good. This article is the result of us visiting each and every on of the manufacturers / retailers and testing out their sheds - our pictures prove we have been there! Even if you can't visit a display / garden centre to see a particular shed before buying, the very fact that there is a display is reassuring. Rule two is to be wary of woffly worded reviews / blogs with no pictures of their own and especially if they have a financial interest in one or more of the shed manufacturers / retailers they are reviewing. Rule three is to research a bit and read the customer reviews. They need to be taken with large pinch of salt but if the majority are clearly one way or the other then take notice. We like to think that this article is the only true, independent review of economy UK sheds on the internet. The pictures are ours to prove we have tested the sheds we have reviewed. When we originally wrote this article we hadn't heard of Albany Sheds. It was only when we were having a new fence installed by Warwickshire Fencing that their name was bought to our attention. Albany Sheds manufacture sheds which are then sold by over 75 selected retailers across the UK. Albany first started in business in 1984 so they are one of the more established businesses included in the review. They manufacture a hug variety of sheds and garden buildings and are towards the top end of the economy shed range. The average price checks (see above for specification) for Albany are only available for tongue and groove construction (they do not sell the cheaper overlap construction) which is £426 including delivery to most of the UK. That price of £426 can vary slightly depending on which retailer you buy from. We visited Warwickshire Sheds to see the quality, construction and price options for the Norfolk range of Albany Sheds. We also visited the Albany Sheds show area in Desborough, Northants. They have a construction service (you provide the concrete or paved base) for £175 (dependent on supplier), delivery is free. The floor and roof are both built to high standards and the floor withstands our "jumping up and down" eminently well. The walls do not let in light and the framing of the shed is thick and sturdy. The door is supplied with a lock and key. The roof and eaves height are more than adequate. We would recommend Albany sheds without hesitation, they represent excellent value for money and are clearly built to last. Your nearest supplier can be found here. B and Q don't manufacture their own sheds, they sell sheds made, principally, by Forest. See our review of Forest (also Larchlap) sheds below here. Forest manufacture sheds but do not sell them direct. The diy stores B&Q and Homebase are two of their largest outlets in the UK. They are marketed under the brand names Forest and Larchlap. The average price checks (see above for specification) for Forest is £279 (overlap construction) including delivery to most of the UK. They do not sell tongue and groove sheds. They have a range of roughly 15 sheds. Ridge height - not stated but one of the lowest, so beware if you are tall! We took a trip to our local B&Q in Banbury to see the display, there were five in all. Three had their doors screwed shut so it was not possible to see the interior of those sheds, only two were open. In all probability it is to prevent wind damage when customers viewed the sheds and left the doors open, but it doesn't inspire confidence. We can confirm that the flooring is weak (it is OSB construction), it is not likely to have a long life and certainly not one to bear any significant weight safely. We certainly wouldn't jump on the floor to test how much it flexed, just walking on it was sufficient proof of its lack of strength. The roof is of the same low quality. Daylight was visible through several of the panels. There was clearly a problem with the door on one shed, it was misaligned significantly to such an extent that daylight was very visible. 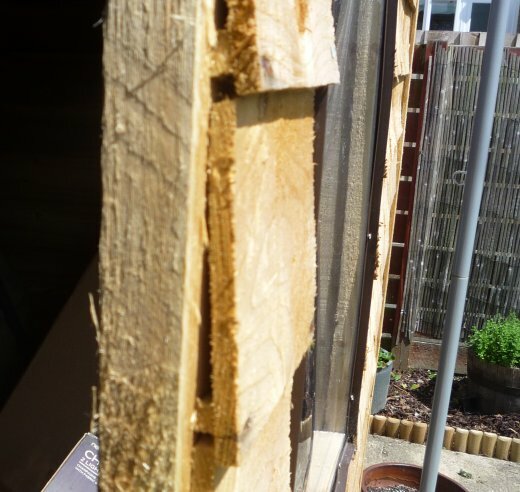 Where daylight is clearly visible through a panel, door or join, water will soon enter and where water enters the contents of the shed will be damaged. The clasp door lock was misaligned and it was difficult to close it. When we did, we were unable to open it again. The overall finish from the outside looked acceptable. SUMMARY: The price is cheap and you get what you pay, a very low quality shed. The B&Q and Homebase names however are a safeguard against receiving the worst customer service, they have a huge reputation to protect. Garden Buildings Direct is a trading name for Kybotech Ltd and they have been in business from 2000. All their sheds are marketed under the BillyOh brand name. As well as buying direct from Garden Buildings Direct you can also buy online from Amazon but the Amazon prices appear to be higher. The average price checks (see above for specification) for Garden Buildings Direct are £265 (overlap construction) and £359 (tongue and groove construction) including delivery to most of the UK. This does include double doors because the single door version does not include a floor and neither does it include roof felt. 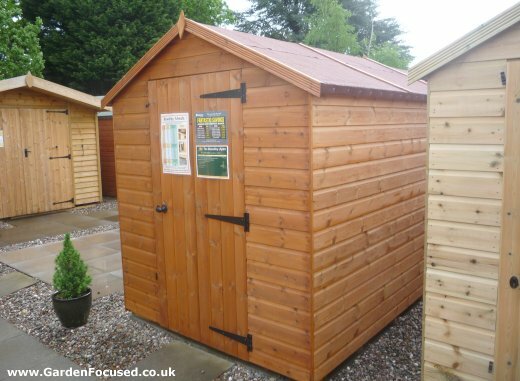 They have a huge range of wood, metal and plastic sheds in a large range of sizes. It seems that BillyOh sheds are at the lower end of the market as far as quality is concerned compared to some other brands. The type of wood is never mentioned. Many reviews indicate that constructing the shed may also prove problematical with panels warping and some roughly cut or not to the correct length. The specifications fail to mention the thickness of load bearing timber and the windows, as many note in the reviews, are the flimsiest plastic. The interior height of the sheds may well pose a problem for some people, these sheds have some of the lowest ceiling heights. We were unable to find a fitting service offered by this company. There are several online review sites that feature BillyOh sheds. Reviews.co.uk have some recent reviews which can be found here. On Trust Pilot they have a rating of 3 out of 5 stars (see here). Amazon is sometimes useful for reviews of products and they do have a few reviews of Garden Building Direct sheds but the highest shed review (excluding the bike storage ones) currently is a 2 star (out of 5 stars) with all the others being 1 star. You can see these reviews here. There are several MumsNet reviews which can be found here, they make unpleasant reading. One worrying aspect about this company is that we have been unable to locate any showroom where you, or anyone else for that matter, can actually view the product before buying it. Call me picky but I would like the option of seeing the sheds before actually buying one of them. Delivery schedules are quoted as being from two to thirty days. Deliveries will be to the kerbside and the driver(s) will unload all parts. Unusually the company write "we may not accept claims for damaged goods if the courier has obtained a clean signature for delivery". That is an unacceptable condition in our view and probably not legally enforceable. SUMMARY: These are cheap sheds and the quality matches the price. If you can't see them before buying, ask yourself the question, why not? GBC do not manufacture sheds, they are retailers. They began business in 1986 at Webbs of Wychbold and have expanded massively in the UK. The vast majority of their sheds are the Malvern range built by MPB who began trading in 1984. 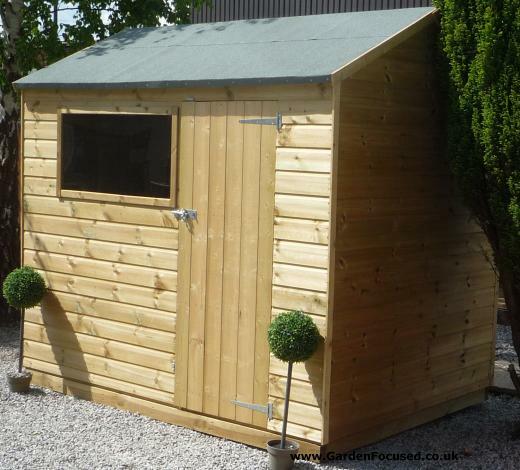 In essence, when you buy a GBC shed you are buying one manufactured by MPB. The average price checks (see above for specification) for GBC are only available for tongue and groove construction (GBC do not sell the cheaper overlap construction) which is £535 including delivery to most of the UK. This puts GBC at the top end of the economy shed market. The model referred to is the Bewdley Apex (see picture below). They have a very large choice of sizes and designs from the basic design of the Bewdley, right up to sheds the size of a small flat! We checked out the sheds in this range and they are very well constructed and likely to last many years, probably decades or so, longer than the cheapest sheds. Windows are real glass (toughened available as an option) rather than flimsy plastic. We visited a GBC showroom at out local garden centre to get some idea of the quality and looks of their sheds. The base passed our jumping up and down test with minimal flex, certainly far better compared to all the other shed floors in this review. 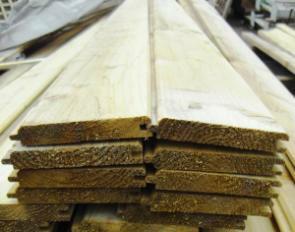 The roofs are built from the same high quality solid timber. The tongue and groove cladding is reasonably thick, does not let light get through, looks and feels good quality. The roof height will be more than adequate for most people. 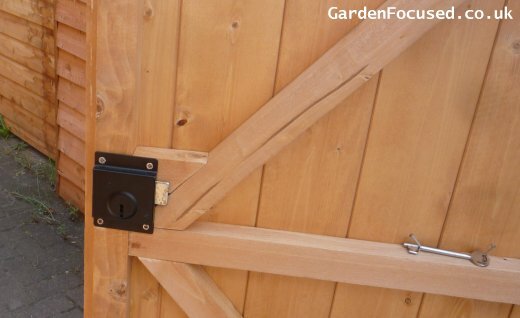 Although cheap wooden sheds are inherently weak and insecure, the GBC sheds do have a handle and a lock to give some minimal security. 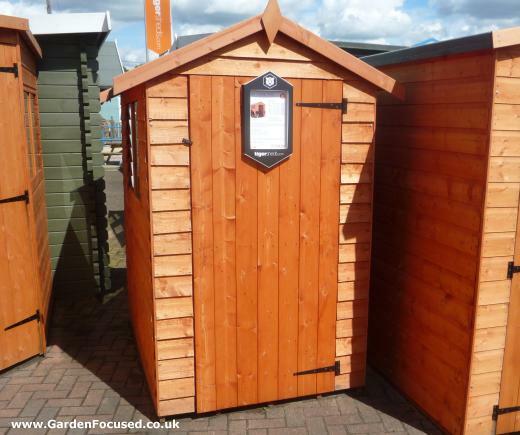 Their sheds are available for viewing all over the UK at larger garden centres (see here for a store locator). They have a construction service (you provide the concrete or paved base) for £95, this is the cheapest of the lot. We were unable to find any online reviews for these sheds, but the fact that they are on display for your own personal viewing at many garden centres around the UK more than makes up for this. This allows you to form your own unbiased opinion. Delivery times are well into the future, they quote six weeks in some instances. SUMMARY: These are medium range sheds, competitively priced and unlikely to disappoint during construction and in the long term. 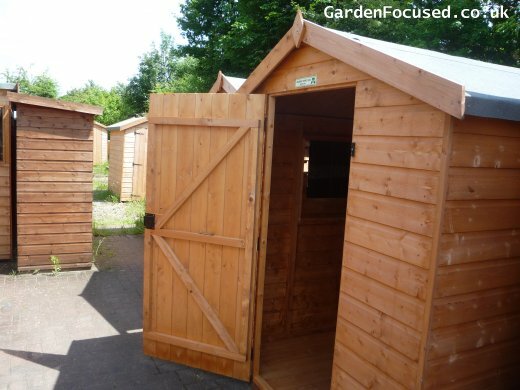 Our review of their basic 8 x 6 shed and what we have seen at their garden centre showrooms leads us to believe that the good quality and value will be carried right through their range. Homebase don't manufacture their own sheds, they sell sheds manufactured by others. They do however display their sheds in may of their stores throughout the UK. They tend to sell two brands, the first is Mercia (which are the same as Walton sheds) so see Waltons sheds review below for details. Homebase are competitive on prices. The second is the Forest / Larchlap brand, which we have reviewed above - see here. Sheds.co.uk don't manufacture their own sheds, they sell sheds online manufactured by others. They have no showrooms so you can't see their sheds before you buy. Either one of those facts would be OK, put the two together and alarm bells should ring. To assist our readers, we investigated whose sheds they were selling and came to the conclusion that it was probably Waltons sheds - maybe not exclusively but certainly the ones we looked at in detail. How have we come to that conclusion? Take a look at the Sheds.co.uk construction manual for their 8 x 6 shed here. It looks exactly the same as the Waltons construction manual here. Buying Waltons sheds direct seems to be significantly cheaper and Waltons do indeed have a showroom where you can see their products. See this shed here (with a price of £450) from Sheds.co.uk and then compare it with with this shed here (with a price of £400) from Waltons. They seem the same shed to me, the only difference I can see is that one retailer is charging £50 above that of the manufacturer. If sheds.co.uk let me know any different I will be happy to post their comments here and / or amend this article. Tiger Sheds are based in Leeds where they both manufacture and distribute their sheds. They have occupied their current large premises since 2008 but the company predates this considerably. The average price checks (see above for specification) for Tiger Sheds are £266 (overlap construction) and £313 (tongue and groove construction) including delivery to most of the UK. The model referred to is the Tiger Overlap Apex (see picture below). They have a large choice of other sizes and designs. Tiger Sheds have their own review pages for each product. For the one we review in detail above they were given 4.9 out of 5 stars. We don't doubt that the reviews are real but we have some doubts that all reviews (including bad ones) are shown. The reviews on Trust Pilot give them a four out five star review rating which is very impressive and probably more realistic. Out of all the cheap end shed reviews, Tiger Sheds gets the joint highest score. The only other review site with up to date comments was Review Centre which gave them 3.5 out of 5 stars. Considering the price, the construction of Tiger sheds represents exceptional value for money. The first thing you notice when you enter the shed is that the floors and doors are made from solid timber not cheap OSB. The strength of the flooring (compared to the OSB floors used by many other manufacturers) is immediately apparent. You can jump on this flooring and their flex is minimal. Great for storing heavy items which might break cheaper flooring. The roof is also made from solid timer for extra strength. The main load bearing beams are made from quality timber and in many instances there are two of them compared to the normal one. This definitely will make a difference to the strength of the shed. You really have to see the construction of a Tiger shed and compare it to a shed costing ten or twenty pounds less to understand the difference. See the picture below. One final point is that the windows are made from real glass not flimsy plastic. They have a construction service (you provide the concrete or paved base) for £139. You can view Tiger sheds at their display centre in Leeds, at Woodlands DIY Store, Horsforth, Leeds LS 18 5NZ. It's in the entrance to the train station. SUMMARY: Tiger sheds are the joker in the pack. Far higher quality than other sheds at or around the same price. Waltons manufacture and sell their own sheds in the UK - their shed range is shared by the Mercia brand. They originally started in 1878 making wooden beehives and now sell over 100,000 sheds every year. The sheds are manufactured in Sutton on Trent, Nottinghamshire. The average price checks (see above for specification) for Waltons are £235 (overlap construction) and £320 (tongue and groove construction) including delivery to most of the UK. Bearing in mind that this is one of the cheapest sheds on the market for the size, it is reasonably well constructed. The price clearly means it is not of the highest quality, but if you are looking simply for a cheap value for money shed, this surely has to be on your shopping list. We took a trip to the Waltons / Mercia show area to see their sheds. The windows will be a let down for many, so flimsy and not opening. As mentioned above, both the floor and roof are OSB (bits of wood glued together to form a single board) and these are flimsy. 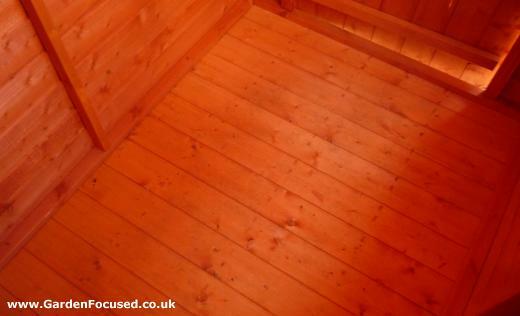 When you walk in the shed (I really wouldn't jump on it, the floor might break), you can feel the floor flex. The finish of the overlap cladding is above average but daylight can still be seen in several places. The tongue and groove sheds (see below) are far better finished and feel stronger. In the cheap sheds the support beams are about 1inch square, not much to support a roof. The main centre beam is held in place by a small L shaped piece of metal. The doors have no handle or lock. You get what you pay for. They provide an assembly service at £155. For each different type of shed there is a specific video showing how to build your particular shed - very useful. 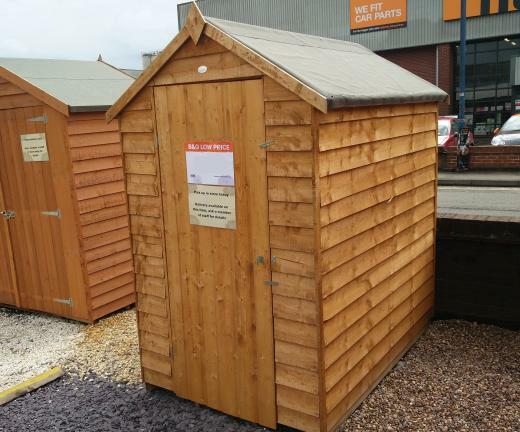 Waltons produce a large range of sheds from the smallest up to large 20ft x 10ft ones at competitive prices. Their own website has a long list of reviews (they promise that they publish every one they receive, good or bad) and overall for a buget shed, they look good. The page can be found on each product page. Waltons appear to have one of the best delivery systems. They let you select the delivery date (often only 48 hours later) and they will deliver within a 2 hour time slot. That is a great time saver. Other reviews we found were Trust Pilot (four out of five stars) and Amazon (three out of five stars). 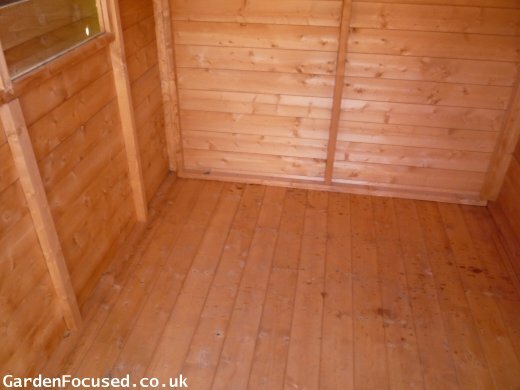 SUMMARY: A low cost shed which delivers just a bit more than some other budget sheds. This value for money aspect will run throughout the Waltons range. The cheapest form of shed construction. Timber sheets overlap each other so that water runs off the exterior. See the picture below. Stronger and more expensive than overlap. Tongue and groove is also more waterproof and has an attractive, more solid appearance. Far cheaper than solid timber, OSB is strands of wood, laid in particular directions, compressed and glued together. It is immediately distinguished from solid timber by its appearance. It is weaker than solid timber and prone to disintegrating when wet for long periods of time.